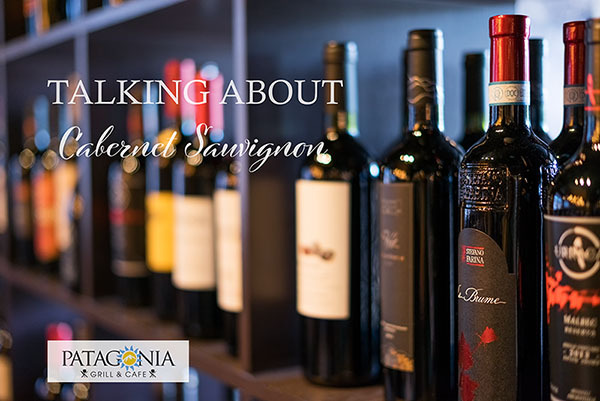 Splendid Wine and superb Premium Steaks? We got you covered!! 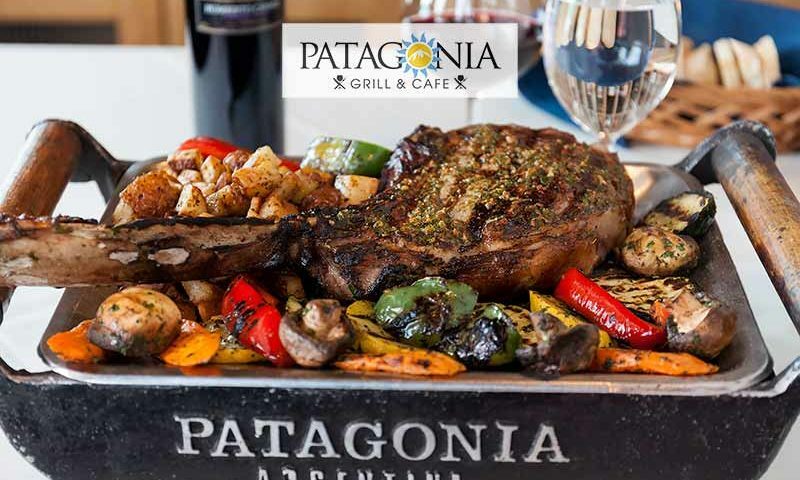 At Patagonia Grill & Café we have a vast variety of Wines, from Argentina swinging by Europe, ending up in California and the most astonishing Prime Angus steaks. The perfect match to have a great meal and enjoy a pleasant time! The mixed grill called Parrillada Mixta can be any combination of meats and poultry. 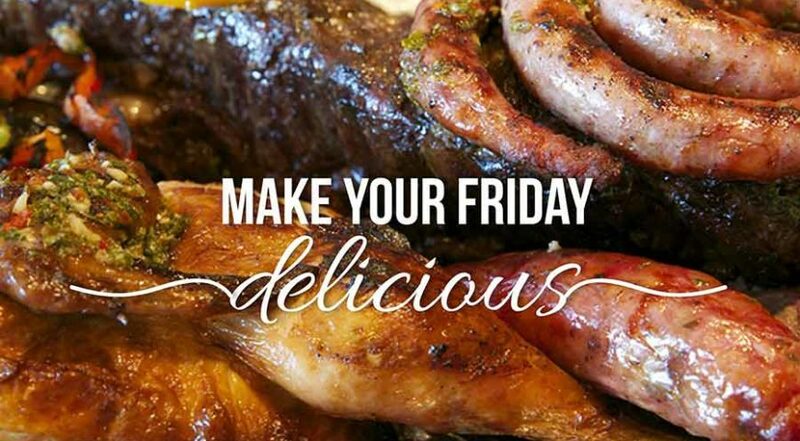 From Outside Skirt to great variations of Sausage our Parrillada will make you feel in heaven! Served o a hot platter with charcoal on the bottom it keeps warm at the table while you enjoy and have a good time. Of course, a nice glass of red wine cannot be out of it, and our Wine menu has plenty of options to match it. The unique taste and tenderness of highly marbled Wagyu beef make for an unrivaled eating experience. Try out our Wagyu NY Strip or RIBEYE to taste the softness and flavor of this incredible steak! A young Cabernet Sauvignon or Malbec, are highly recommended to help this Steak taste more mellow. Visit us and enjoy this wonderful experience today! Cabernet Sauvignon grapes are among the most widely grown, widely know, and widely enjoyed grapes for red wine. 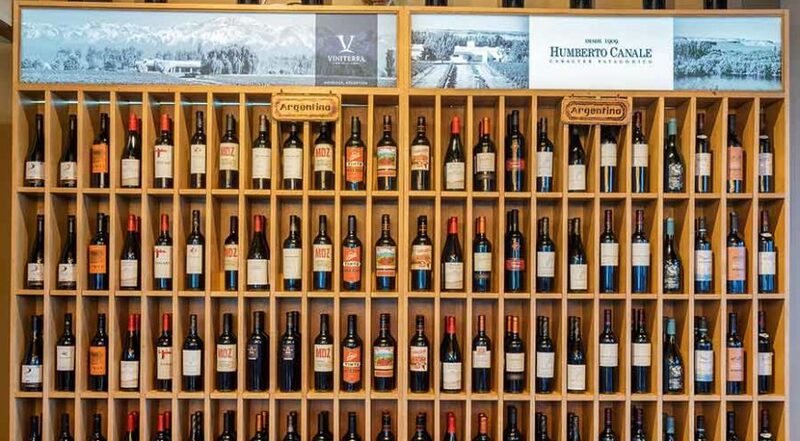 The flavors and aromas of Cabernet Sauvignon wines include vanilla, currants, and even green bell pepper if made form underride Cabernet Sauvignon grapes. 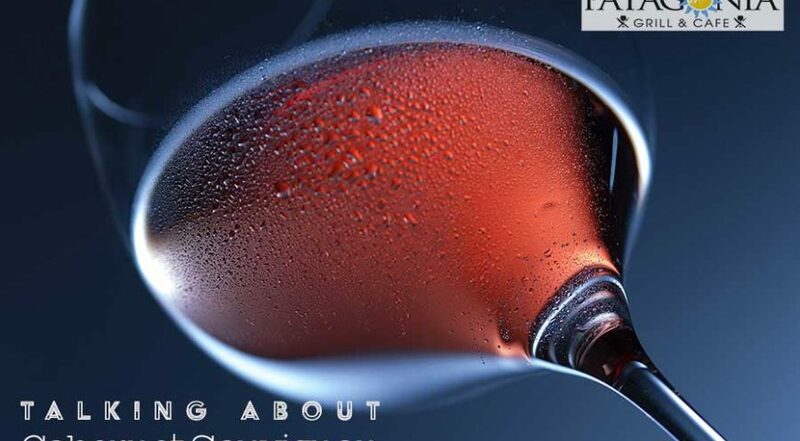 Other characteristics of Cabernet Sauvignon wine include high alcohol levels and firm tannins. These strong tannins make it easier to age Cabernet Sauvignon in cellars for many decades. Come and appreciate a delicious steak with our specially selected Cabernet Sauvignon wine list! Cuts of lamb which are made by cutting at an angle perpendicular to the spine, generating a single serving of meat which is traditionally cooked and served with the bone in. 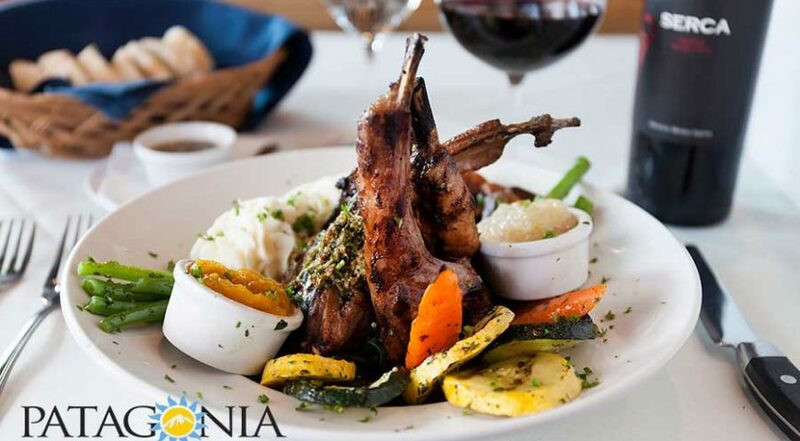 Our Lamb chops are served on a bed of spinach with mashed potatoes, fresh grilled veggies and Peach and Pear sauce! Strong red wine is particularly delicious with lamb, a Sauvignon or even a Malbec are an excellent match to enjoy this exquisite meal fully. Yes, we also have Seafood! 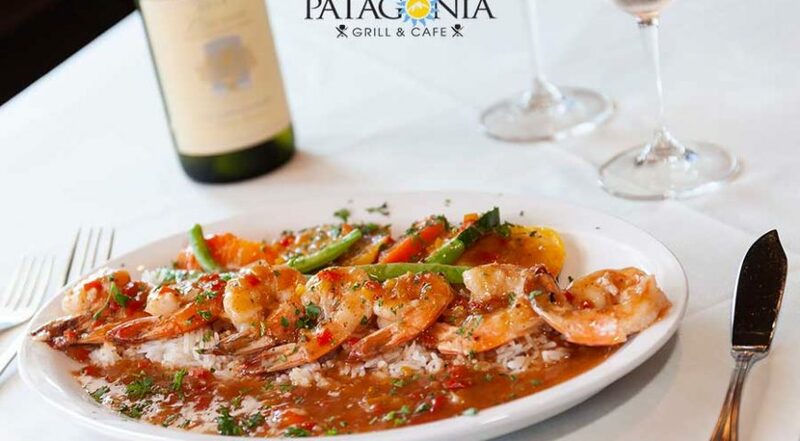 Fresh Jumbo Shrimps served with a heavenly Cognac Sauce, Grilled Veggies and Basmati rice. A Sauvignon Blanc wine will be the perfect combination to complete your experience and thoroughly enjoy it! Tender, juicy, the Outside Skirt Steak is one of the most flavorful cuts of beef. It has a considerable amount of fat within and between the muscle strands, which helps to keep it moist when grilling it. 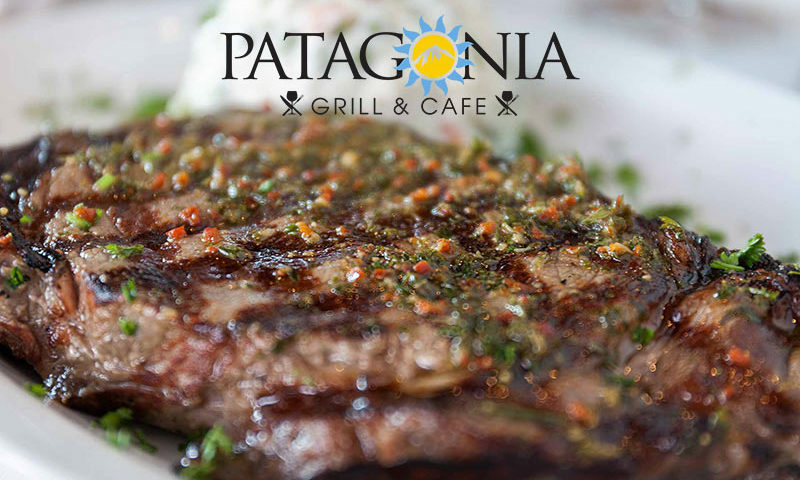 Grilled to the perfection and served with our unique Chimichurri sauce, this fantastic steak calls for a great Malbec glass. Ceviche is a Latin American recipe for raw fish and seafood marinated in citrus juice, mainly lime and lemon. The acid in the citrus denatures the proteins in the fish, causing it to become opaque and producing a firm texture. A splendid appetizer to enjoy with a nice glass of Sauvignon Blanc! 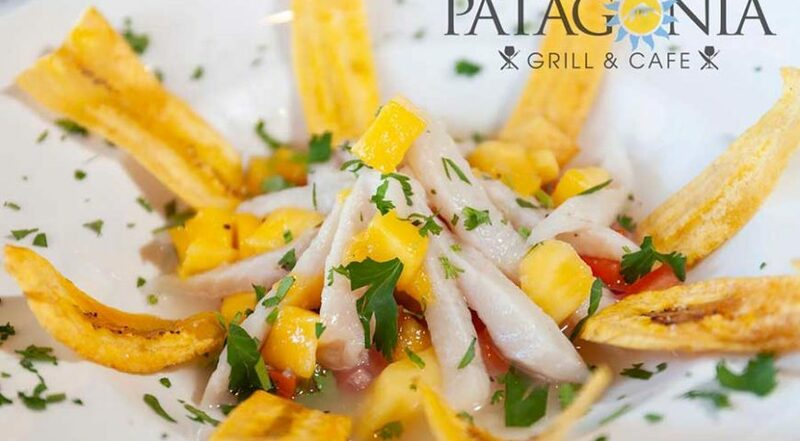 Do it by the order, served with mango, onions, tomatoes, parsley, and fresh Tilapia, our Ceviche will start your dinner with freshness and style. Come and appreciate a delicious Premium Steak with our specially selected Cabernet Sauvignon wine list — from Argentina to California. The Tomahawk Steak is an on-the bone Rib Steak, it has quite a large amount of inter-muscular fat, which gives it a load of flavor when grilled, as flavors are released from both the huge bone, and inter-muscular fat during roasting to give a sweet gelatinous flavor. 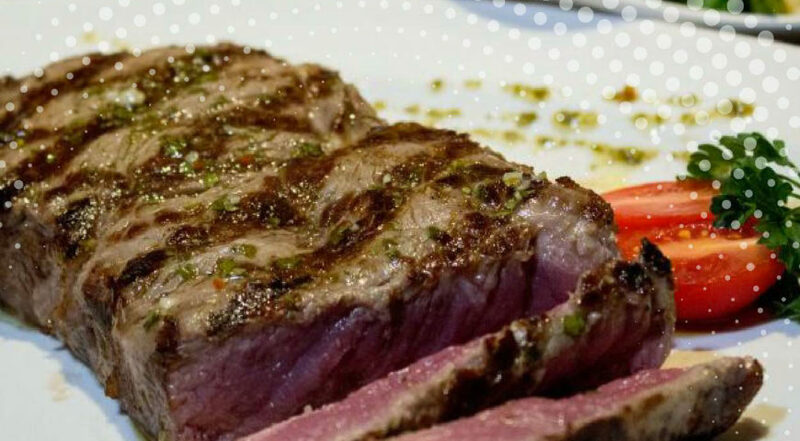 We have a special selected variety of Wines to appreciate this wonderful steak. An exceptional $25 four-course menu with a little bit of our best for your delight. Bring the experience of your lunch to another level! We will be more than happy on being part of your company celebration lunch! 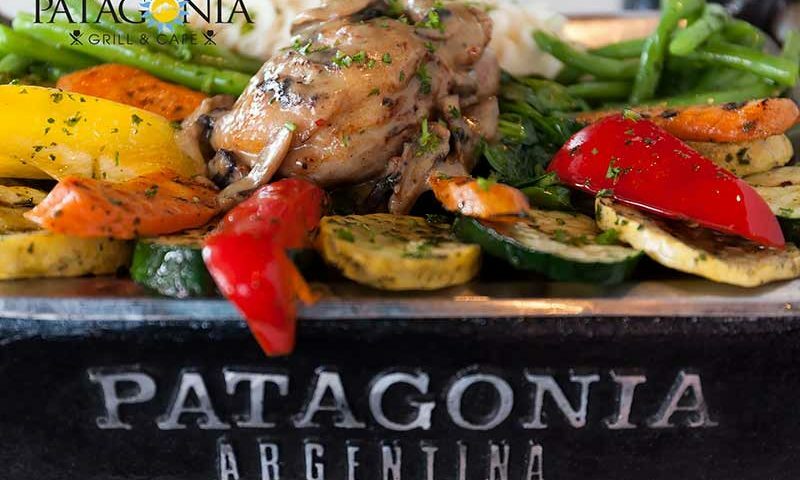 Enjoy this extraordinary day with your beloved at Patagonia Grill and Café! 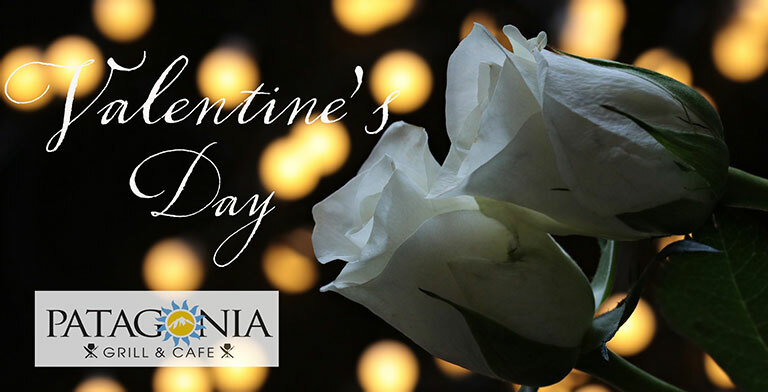 A delectable five-course menu, a romantic atmosphere and a prime service to bring your Valentine’s day experience to the next level. Thank you for your support, we are pleased and proud to have you all as our customers! 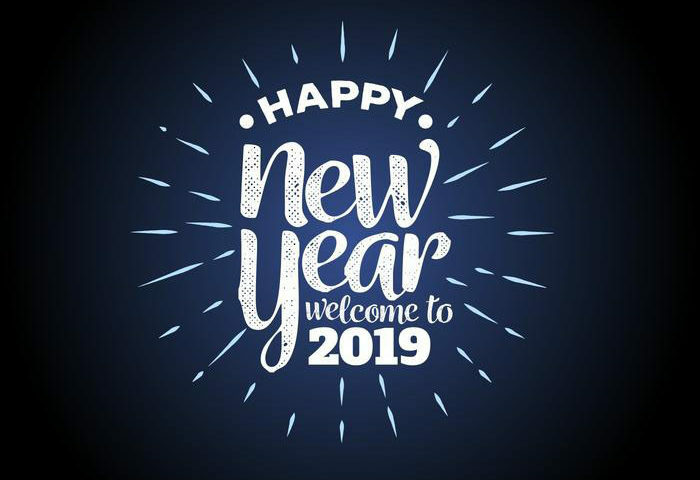 We look forward to seeing you all in 2019!! Our hours have slightly changed, please check our new hours of operation. 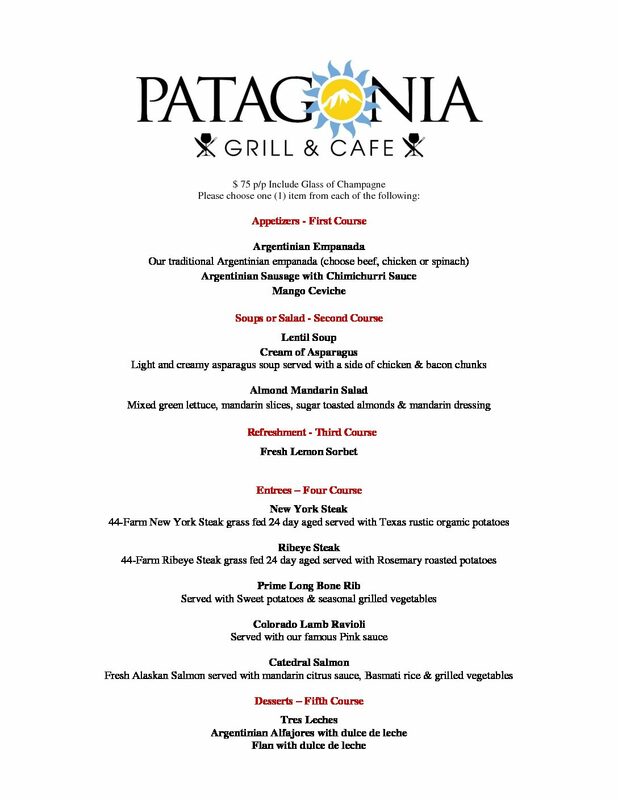 New Years Eve dinner at Patagonia Grill & Cafe! An outstanding five-course Menu, live music added to the New Years eve atmosphere, the main ingredients to have a wonderful time! Don’t wait until last minute, make your reservation today! 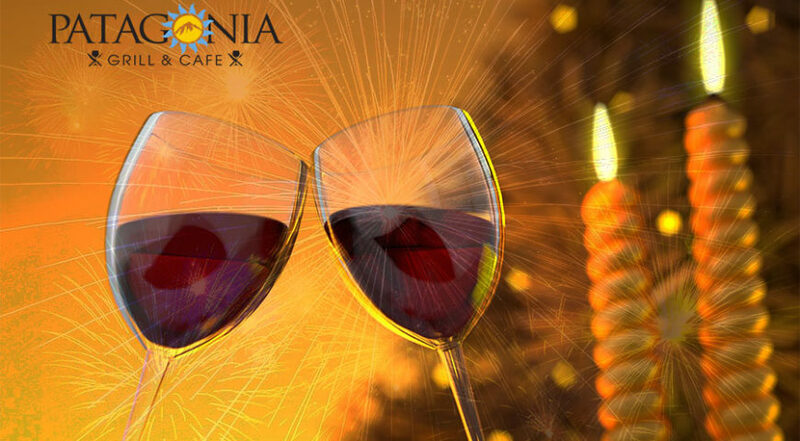 We invite you and your family to join and celebrate together with an unforgettable New Years Eve dinner at Patagonia Grill & Cafe! An outstanding five-course Menu added to the New Years eve atmosphere, the main ingredients to have a wonderful time! 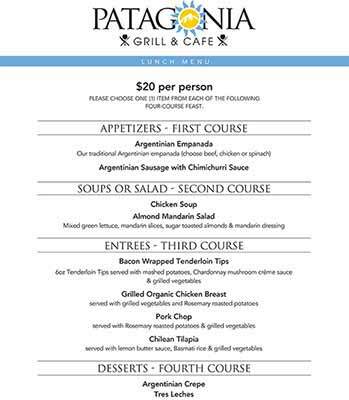 We invite you and your family to join and celebrate together with an unforgettable Christmas Eve dinner at Patagonia Grill & Cafe! An outstanding four-course Menu added to the Christmas atmosphere all over the restaurant, the main ingredients to have the finest Christmas Eve of all times! 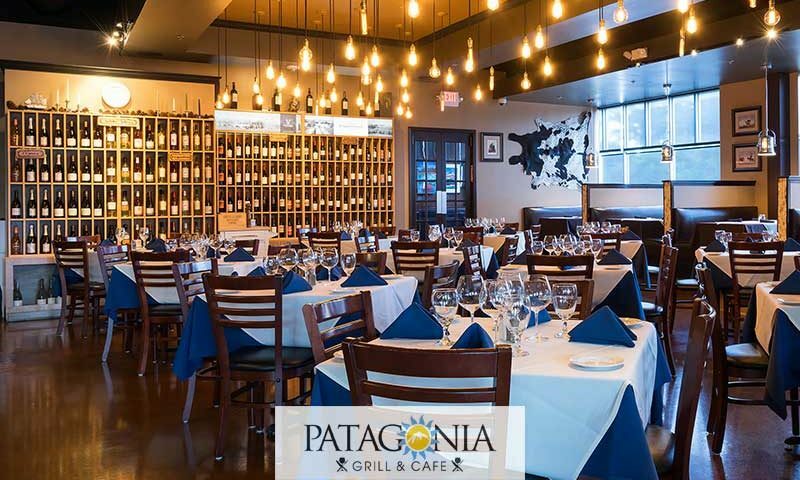 Patagonia Grill & Cafe want to thank you all for coming to our 4th Anniversary Party! We hope you all had a great time and enjoyed as much as we did. We are very proud to have you as our customers and look forward to seeing you again! 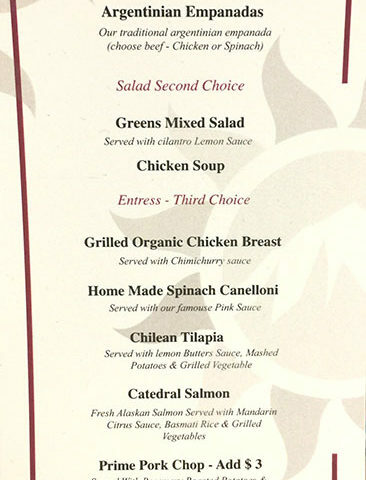 Outstanding $20 four course menu with a little bit of each of our best for you to choose. We will be more than happy on being part of your company meeting or celebration lunch! This Argentinian cut of Short Rib is extremely rich in flavor! The meat is mixed with grease and with the bone marrow cells, which brings a unique and delightful flavor when grilled. 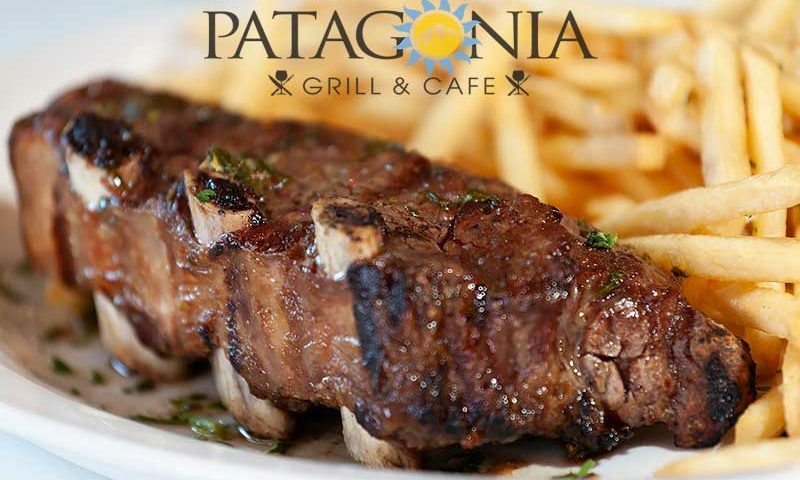 A full body Malbec or Cabernet Sauvignon are highly recommended to fully enjoy this marvelous Rib! Duck is a lean meat – comparable in fat and calories to a skinless chicken or turkey breast. It’s also an excellent source of selenium and zinc, both of which encourage good cellular metabolism. Duck tends to need a wine with some sharpness and acidity to cut through, and some ripe fruit to contrast with the rich flesh, such as Pinot Noir and Merlot. Try out our Sautéed Duck with a maple bourbon mushroom sauce, mashed potatoes and grilled vegetables, a must! 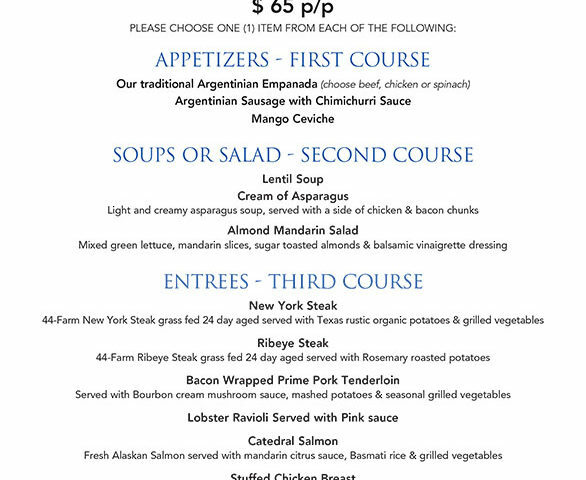 Make your reservation today and come enjoy a dinner with elegance! Pinot noir grapes are grown around the world, mostly in the cooler climates, and the grape is chiefly associated with the Burgundy region of France. Pinot Noir pairs well with a wide range of foods—fruitier versions make a great match with salmon or pasta, bigger more tannic Pinots are ideal with duck and leaner filet steaks. 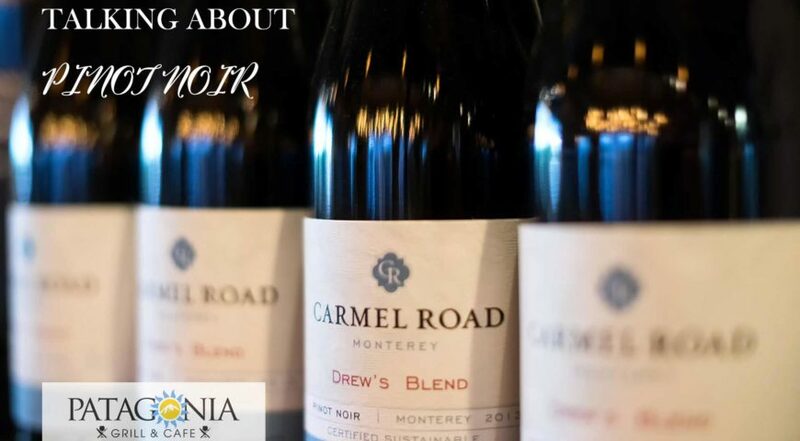 With specially selected Pinot Noir’s wines to match our menu, we made your experience move to another level. A Double Bone Pork Chop also called a “Butterfly chop” it’s a very thick cut that is taken from the loin eye and then cut again to make the butterfly. 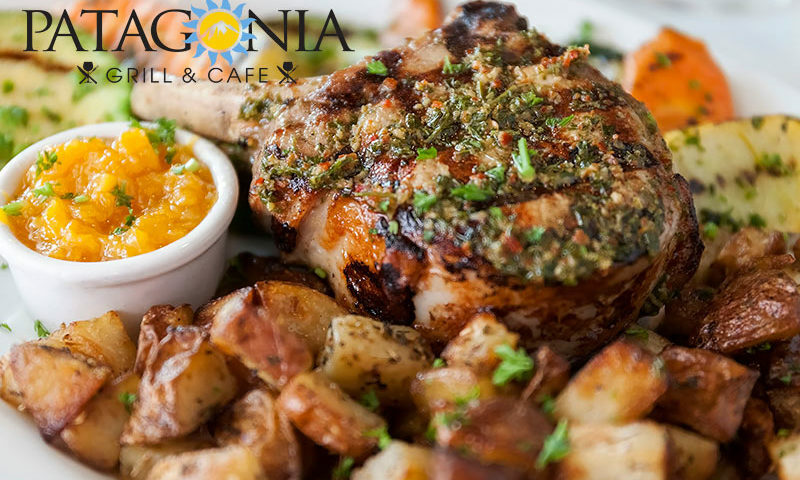 Grilled to the perfection, served with our delicious rosemary potatoes and grilled veggies, this is one of our menu top picks! Pork pairs well with a low-tannin red or white wine with some fruit and acidity to match the flavor, like a Chardonnay or a light Pinot Noir. 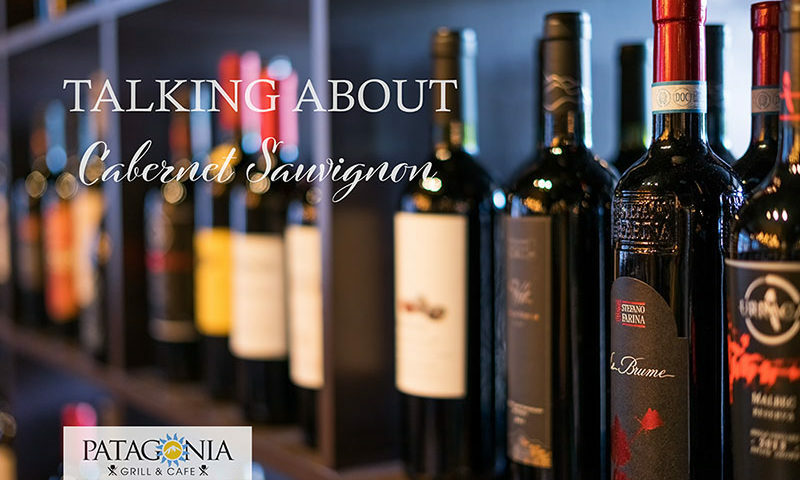 Don’t forget to check our specially selected Wine menu to fully enjoy your experience! 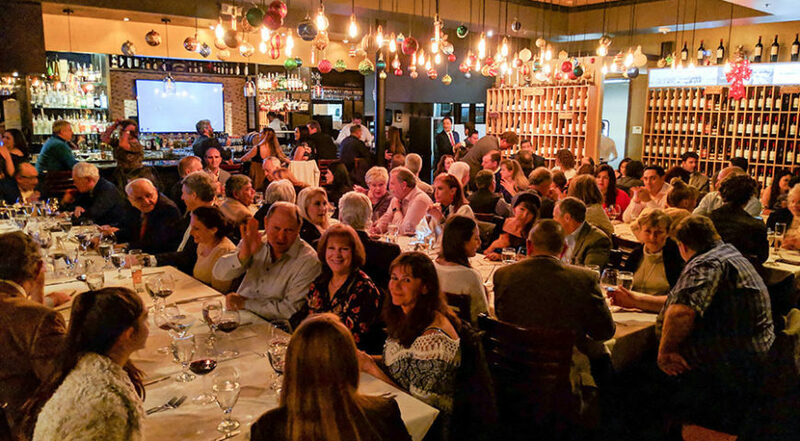 Planning a Holiday or a Private party? 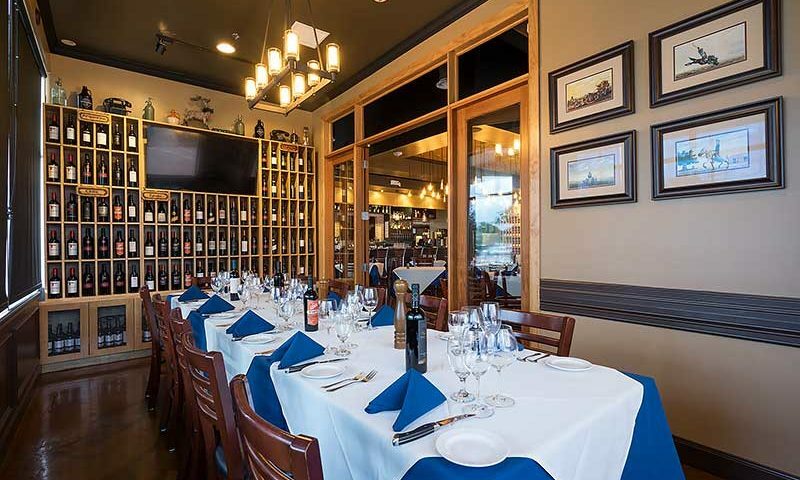 We have a wonderful private room with all comfort and privacy for lunches, brunches, and dinners. Our Holiday and Private Party menus are flexible and perfect for your event either large or small, as well as a variety of drinks, cocktails and a specially selected Wine list to enjoy. Let us be part of it! Our team is ready to give you customized support for all your needs. The Tomahawk Steak is an on-the-bone Rib Steak it has quite a large amount of inter-muscular fat, which gives it a load of flavor when grilled, as flavors are released from both the huge bone and inter-muscular fat during roasting to give a sweet gelatinous flavor. We have a specially selected variety of Wines to appreciate this wonderful steak. Outstanding four course menu with a little bit of each of our best for you to choose. Malbec grapes tend to have an inky dark color and robust tannins, and are known as one of the six grapes allowed in the blend of red Bordeaux wine. Today, Mendoza – Argentina leads production of the grape with over 75% of all the acres of Malbec in the world. In a way, Argentina reinvigorated Malbec as one of the top 18 noble grapes. 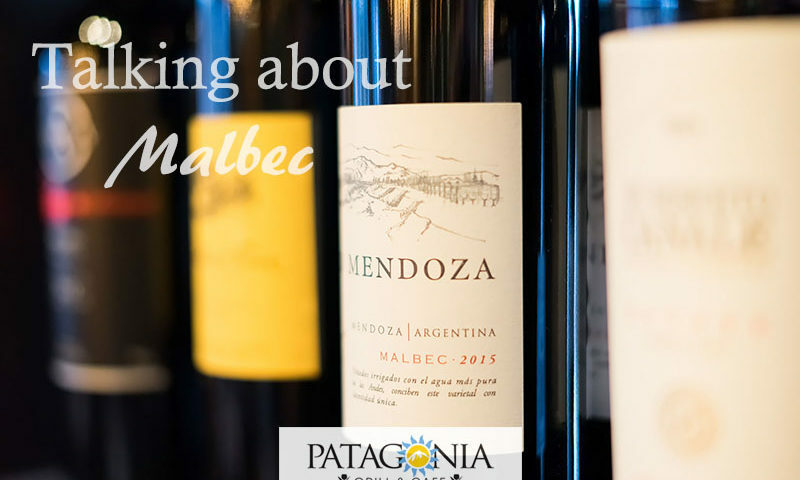 The main fruit flavors in a glass of Argentine Malbec are blackberry, plum, and black cherry. The nuanced flavors offer milk chocolate, cocoa powder, violet flowers, leather, and, depending on the amount of oak aging, a sweet tobacco finish. The perfect match with our 100% Premium Angus Steaks! 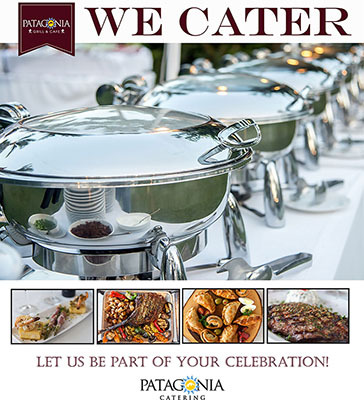 Using only the freshest ingredients combined to our passion for making them into a unique experience, our catering services brings the elegance and attention with food that is alluring and appetizing. Call us today, our team is ready to give you a customized support. 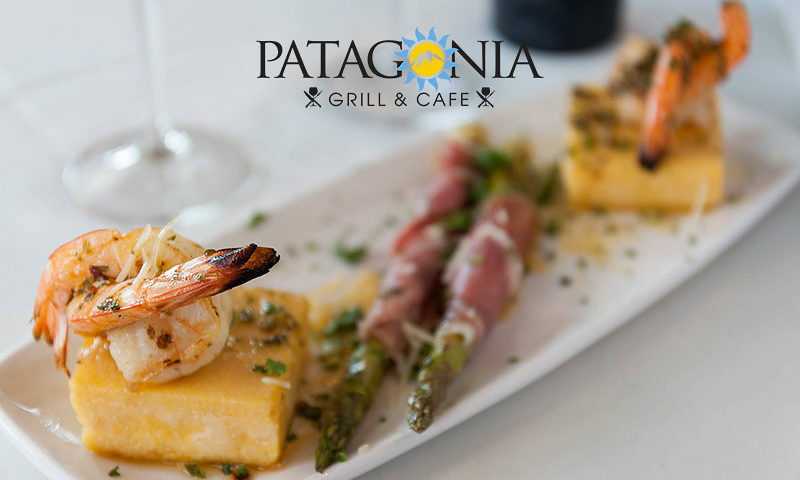 Appetizing Grilled Jumbo Shrimps on top of our creamy polenta and to complete two fresh grilled asparagus wrapped with Prosciutto di Parma! Splendid with a glass of Chardonnay – an elegant way to start your dinner. 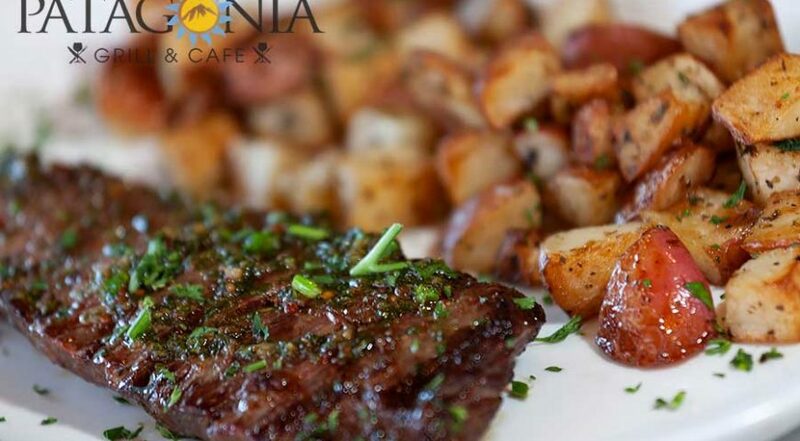 Try the delicious 100% Premium Angus Beef Ribeye with our unique Argentinian Chimichurri sauce. This incredible steak calls for a fine glass of Malbec wine, enhancing your experience and bringing your dinner to another level. End your dinner with elegance! 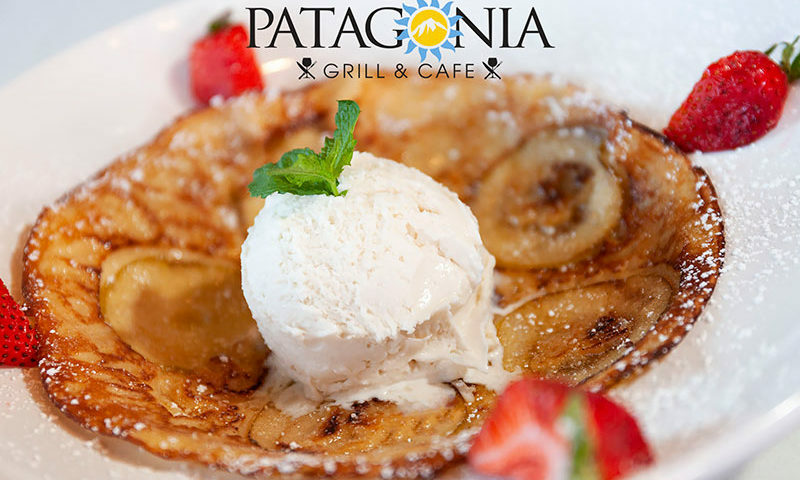 Try out our delicate Patagonia Family Crepe, covered with fresh apple slices, flambé with Cognac, a creamy homemade Vanilla Gelato and strawberries to impeccably balance it. Simply perfect to enjoy it with a Porto wine! Other characteristics of Cabernet Sauvignon wine include high alcohol levels and strong tannins. These strong tannins make it easier to age Cabernet Sauvignon in cellars for many decades. Come and appreciate an appetizing steak with our specially selected Cabernet Sauvignon wine list! 22 Oz. 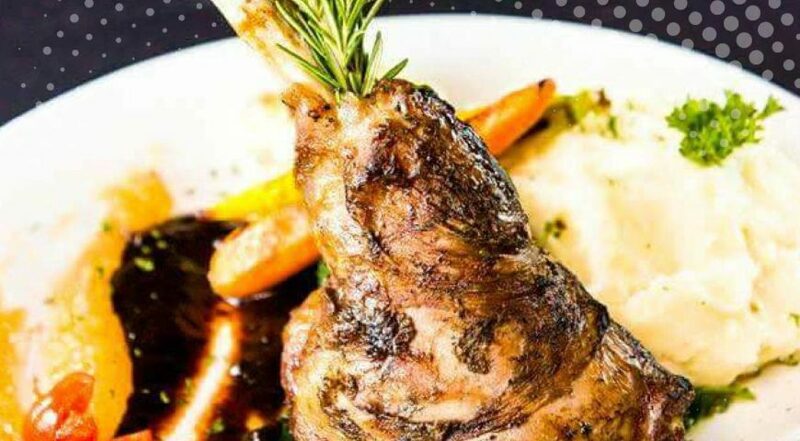 Lamb Hind Shank carefully seasoned with fresh herbs and mint. 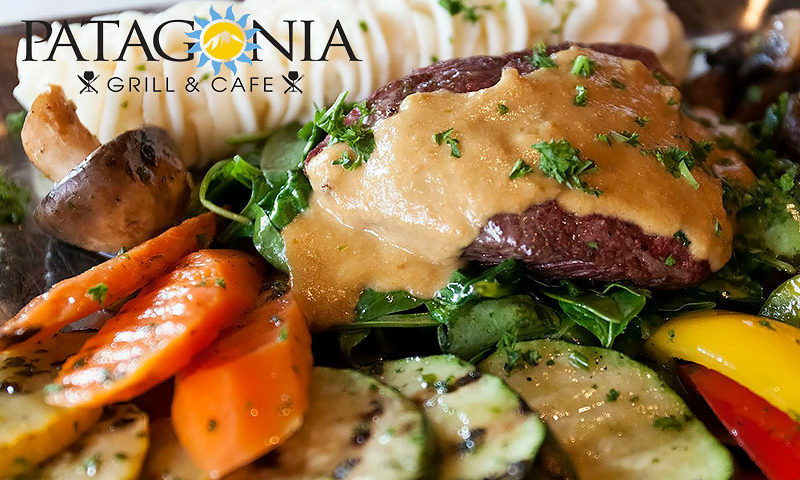 Served on a bed of spinach, our delicious mashed potatoes and fresh grilled veggies. Bring a special atmosphere to your dining experience! 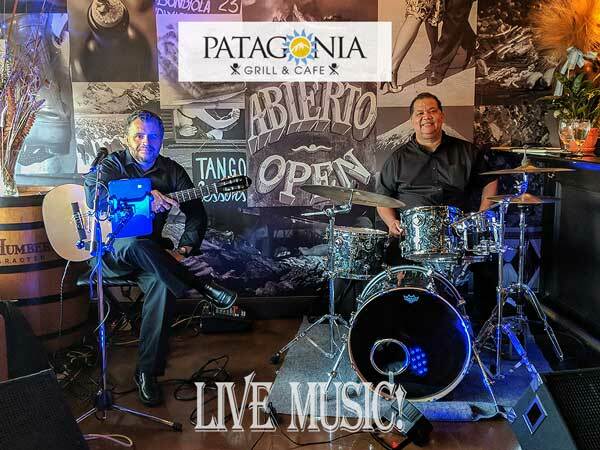 Appreciate your dinner with our singular selection wine list, listening to Bossa Nova, Jazz and more with the Bayou Strings! Every Friday from 6:30 to 9:30 pm!